A solar flare registered as C8.7 was detected at 00:21 UTC on February 6, 2013. The source of the flare was decaying Active Region 1667. 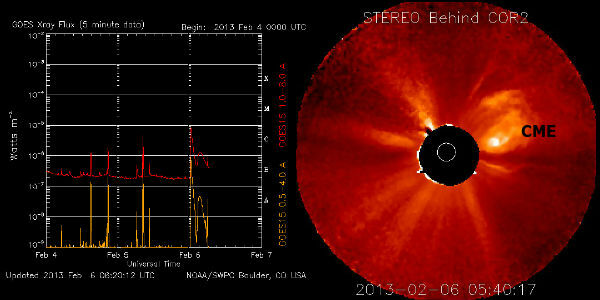 According to images from NASA's STEREO-B spacecraft, the associated CME appears to be heading in the Earth direction, with expected time of arrival on February 8/9, 2013. During the eruption of C8.7 solar flare around Sunspot 1667. SolarHam posted great video of a blob of plasma above the blast site, captured "spinning like a Tornado vortex". 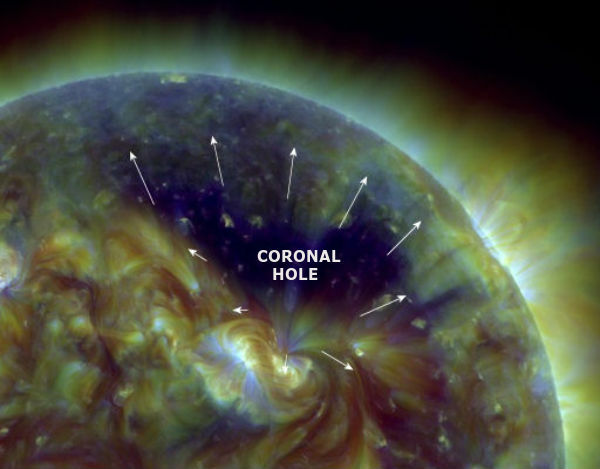 Huge coronal hole has opened up in the sun's northern hemisphere and it is spewing a stream of solar wind which should reach Earth's orbit on February 7/8, 2013. The solar wind stream will bring a glancing blow and polar auroras later this week.